ANNEMOND (CHAMOND), Archbishop of Lyons, friend of St. Wilfrid (12th October), and godfather of Clotaire III. He was murdered by the tyrant Ebroin in Châlon-sur-Saône in 657. CONWALL (CONVAL), an Irish priest, St. Conwall went to Scotland where he became a disciple of St. Kentigern Mungo (13th January) and worked to spread the Gospel. He reposed circa 630. EUSTOCHIUM, the third daughter of St. Paula (26th January). She received monastic tonsure from St. Jerome (30th September) in 382. In 386, SS. Eustochium and Paula accompanied St. Jerome to Bethlehem where St. Eustochium assisted St. Jerome with his Bible translation work, and he dedicated his commentaries on Isaias and Ezekiel to her. Whilst in Bethlehem St. Jerome founded several monasteries, making St. Paula abbess of them. Following the repose of St. Paula (404), St. Eustochium became abbess, serving until her repose in 419. EXUPERIUS (SOUPIRE), fifth Bishop of Toulouse from circa 400 until his repose sometime after circa 410 - 412. 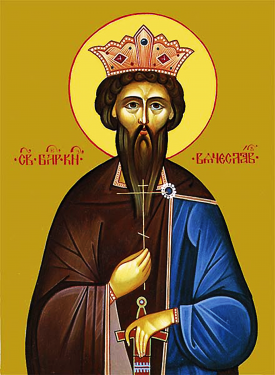 As bishop St. Exuperius finished construction of the Basilica of St. Saturninus, begun by his predecessor, but he is best remembered for his great austerity and simplicity of life, and selfless charity not just to the people of his diocese, but also to the monks of the Holy Land, Egypt, and Libya. St. Jerome (30th September) praised his virtues, and in appreciation for his gifts, St. Jerome dedicated his Commentary on Zacharias to St. Exuperius. FAUSTUS, born in Brittany circa 408, St. Faustus received monastic tonsure at the Abbey of Our Lady of Lérins, and later served as Abbot. He was consecrated second Bishop of Riez (in present-day Alpes-de-Haute-Provence) circa 459. Throughout his life, St. Faustus was a resolute opponent of both Arianism and Pelagianism; and continued the work of St. John Cassian (23rd July) defending orthodox doctrine against heresy. St. Faustus reposed circa 490. LIOBA, one of the group of nuns from Wimborne Abbey (Dorset), who, at St. Boniface's (5th June) request, left England for Friesland in 748 to assist him in his Apostolic labours. St. Boniface made her Abbess of the newly founded Abbey at Bischoffsheim. St. Lioba and her nuns played a key role in the conversion of the Germans. She reposed circa 781, and was buried, like St. Boniface, at Fulda. MACHAN, (Date Unknown), a Scot who trained in Ireland before going to Rome, St. Machan was consecrated bishop, and then returned to his native land. Aside from an entry in the Aberdeen Breviary alluding to his miracles, nothing certain is known of his life. 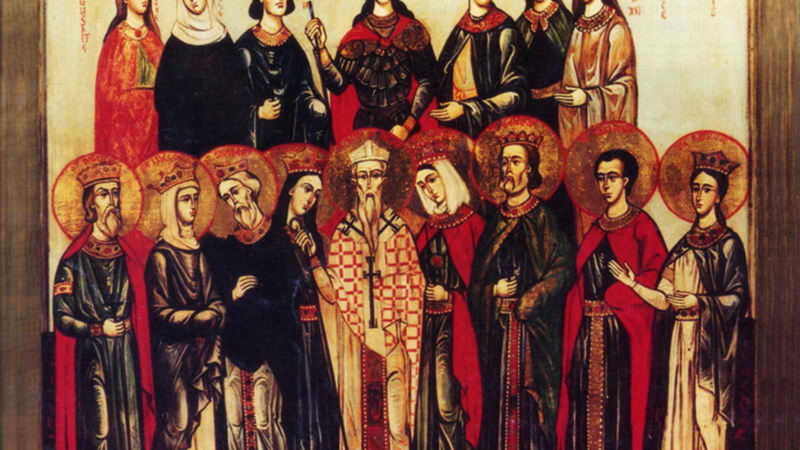 MARTIAL, LAURENCE, and COMPANIONS, (Date Unknown), a group of twenty-two martyrs in Numidia (present-day Algeria). PATERNUS, a second century Bishop of Auch in present-day southwestern France. PRIVATUS, a Roman who was scourged to death in 223, during the persecutions of Alexander Severus. SILVINUS, a fifth century Bishop of Brescia in Lombardy. St. Silvinus reposed in 444. SOLOMON (SALONIUS), the first Bishop of Genoa, he reposed circa 269. STACTEUS, (Date Unknown), a martyr in Rome of whom no further information is extant. TETTA, St. Tetta was an Abbess of Wimborne in Dorset, England, and a friend of St. Boniface (5th June). St. Tetta sent nuns from Wimborne to support St. Boniface in his evangelisation of the Germans. St. Tetta reposed in the second half of the eighth century, and many miracles were attributed to her intercession. WENCESLAS (WENCESLAUS, VIACHESLAV), Prince of Bohemia, he was raised as a Christian by his grandmother, the future martyr St. Ludmilla (16th September). He promoted the spread of Christianity throughout Bohemia which was met with great hostility by the native pagans. St. Wenceslas was martyred as a result of a plot fomented by a group of pagan nobles and Boleslaus, his pagan brother and heir to the throne, circa 935. St. Wenceslas is the patron-saint of Czechia, and is the subject of the popular Carol, Good King Wenceslas , published by John Mason Neale in 1853. WILLIGOD and MARTIN, (Seventh Century), founders of the monastery of Romont, they served as the first and second Abbots, respectively.